1.1. 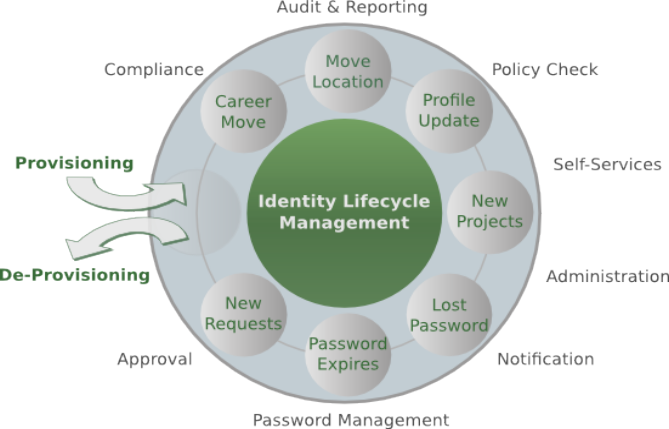 What is Identity Management, anyway? 1.2.1. Aren’t Identity Stores enough? This document is under active development and discussion! If you find errors or omissions in this document, please don’t hesitate to submit an issue or open a pull request with a fix. We also encourage you to ask questions and discuss any aspects of the project on the mailing lists or IRC. New contributors are always welcome! 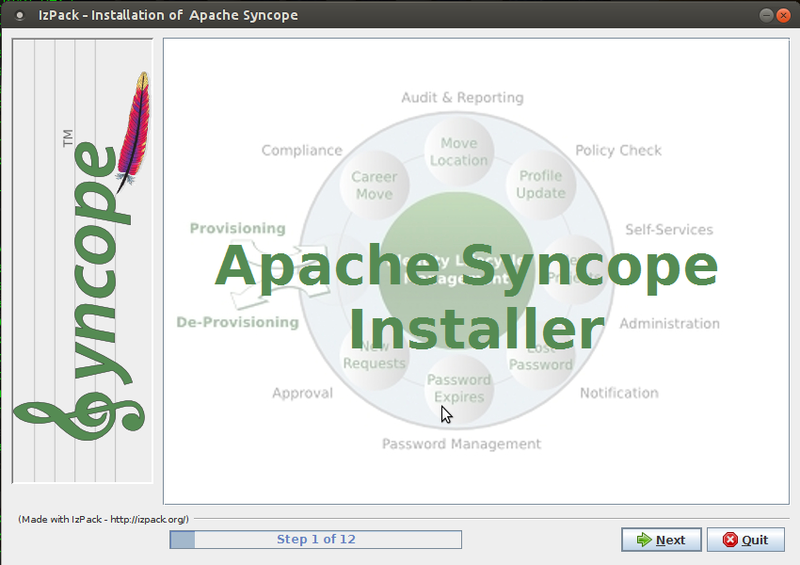 This guide shows you how to get started with Apache Syncope services for identity management, provisioning, and compliance. 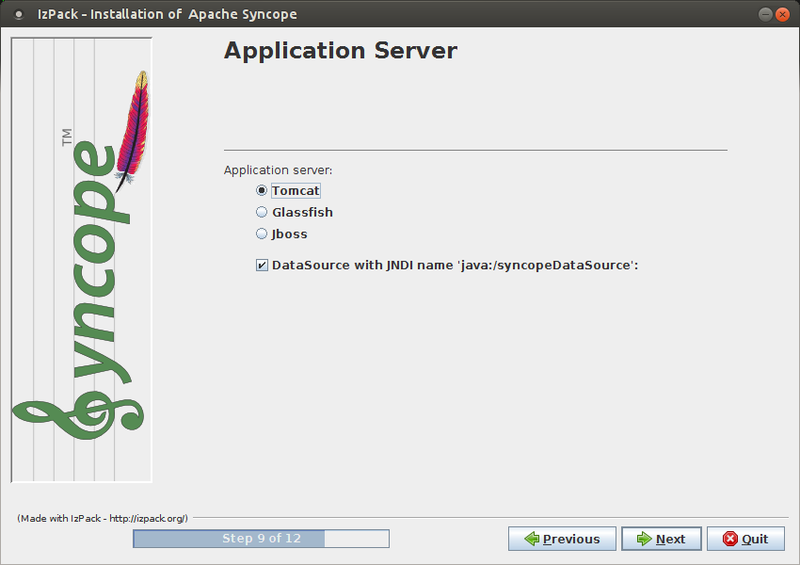 Apache Syncope is an Open Source system for managing digital identities in enterprise environments, implemented in Java EE technology and released under the Apache 2.0 license. Where is this information going to come from? And what happens when you need to be enabled for more applications? And what if you get promoted and acquire more rights on the applications you already had access to? Most important, what happens when you quit or they gently let you go? 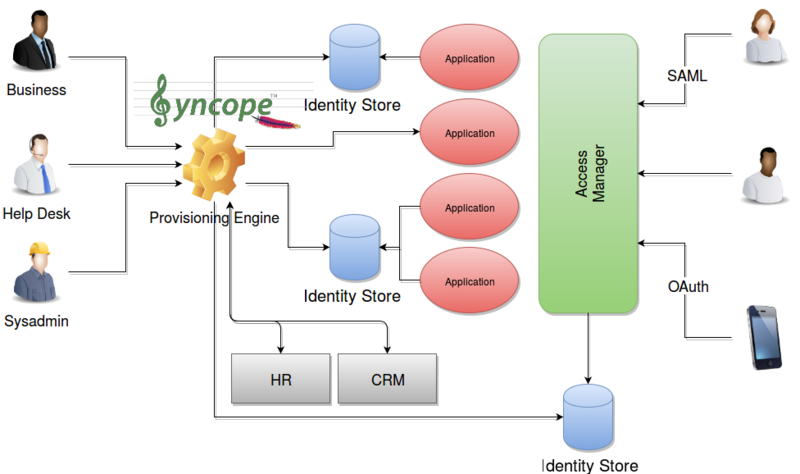 With Apache Syncope 2.0.0, the managed identities are not limited anymore to Users and Groups. New object types can be defined so that Any Object’s data can be managed through Syncope: workstations, printers, folders, sensors, services, and so on. This positions Apache Syncope at the forefront for bringing Identity Management to the IoT world. 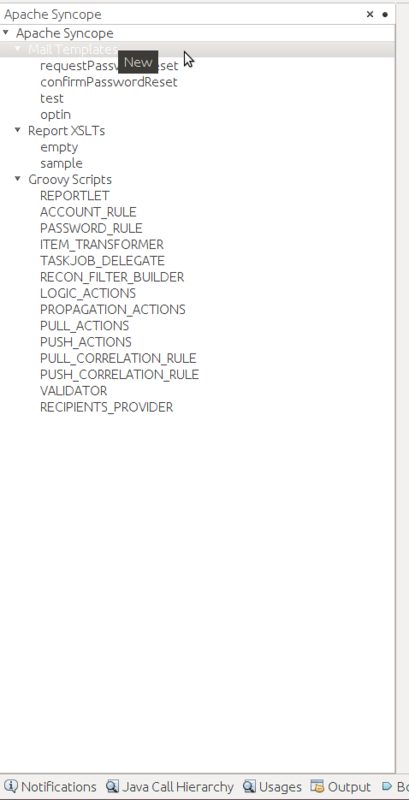 Access Manager - access mediator to all applications, focused on application front-end, taking care of authentication (Single Sign-On), authorization (OAuth, XACML) and federation (SAML, OpenID Connect). 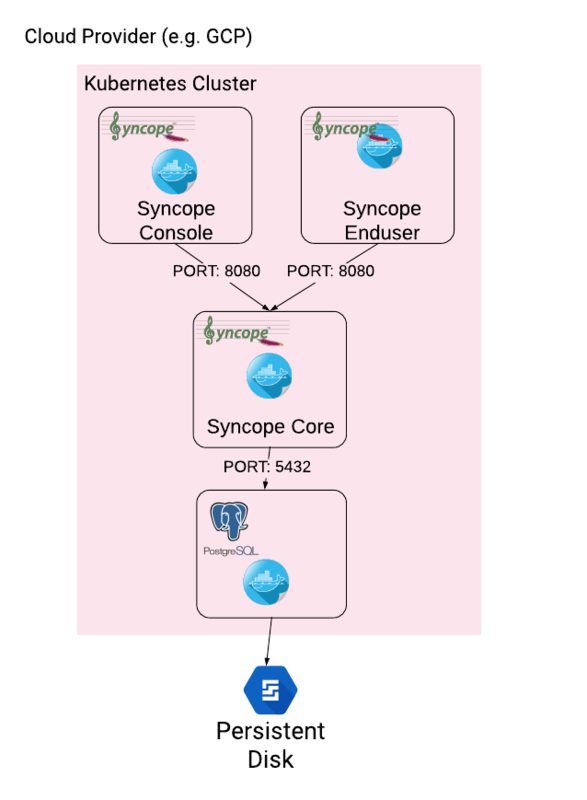 From a technology point of view, Apache Syncope is primarily a Provisioning Engine. Admin UI is the web-based console for configuring and administering running deployments, with full support for delegated administration. End-user UI is the web-based application for self-registration, self-service and password reset. CLI is the command-line application for interacting with Apache Syncope from scripts, particularly useful for system administrators. Core is the central component, providing all services offered by Apache Syncope. It exposes a fully-compliant JAX-RS 2.0 RESTful interface which enables third-party applications, written in any programming language, to consume IdM services. Provisioning is involved with managing the internal (via workflow) and external (via specific connectors) representation of Users, Groups and Any Objects. This component often needs to be tailored to meet the requirements of a specific deployment, as it is the crucial decision point for defining and enforcing the consistency and transformations between internal and external data. The default all-Java implementation can be extended for this purpose. In addition, an Apache Camel-based implementation is also available as an extension, which brings all the power of runtime changes and adaptation. 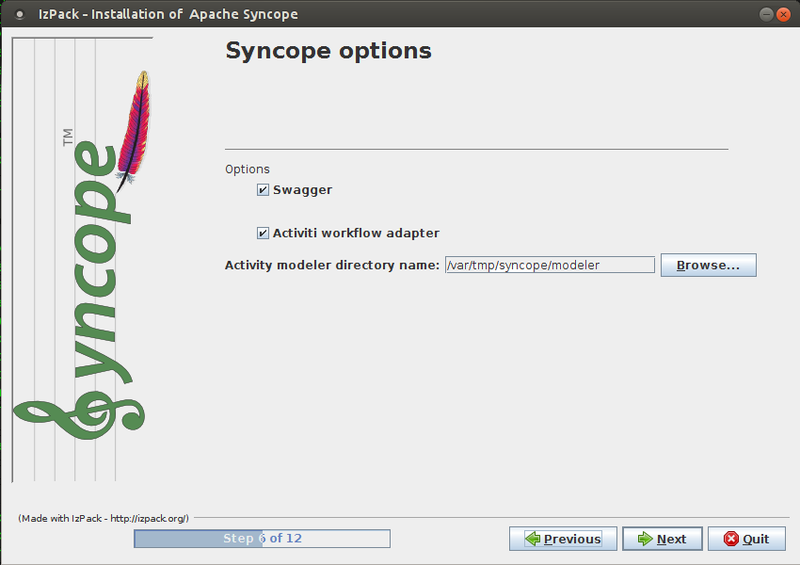 Workflow is one of the pluggable aspects of Apache Syncope: this lets every deployment choose the preferred engine from a provided list - including one based on Flowable, the reference open source BPMN 2.0 implementations - or define new, custom ones. Persistence manages all data (users, groups, attributes, resources, …​) at a high level using a standard JPA 2.0 approach. The data is persisted to an underlying database, referred to as Internal Storage. 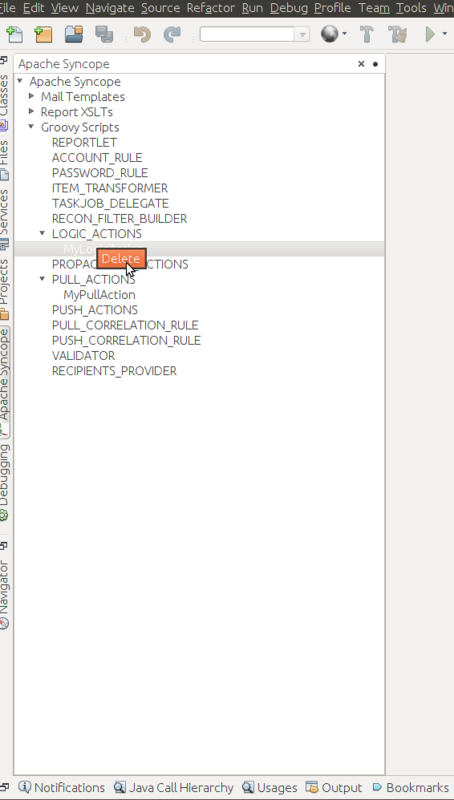 Consistency is ensured via the comprehensive transaction management provided by the Spring Framework. Globally, this offers the ability to easily scale up to a million entities and at the same time allows great portability with no code changes: MySQL, MariaDB, PostgreSQL, Oracle and MS SQL Server are fully supported deployment options. Security defines a fine-grained set of entitlements which can be granted to administrators, thus enabling the implementation of delegated administration scenarios. Third-party applications are provided full access to IdM services by leveraging the REST interface, either via the Java Client Library (the basis of Admin UI, End-user UI and CLI) or plain HTTP calls. 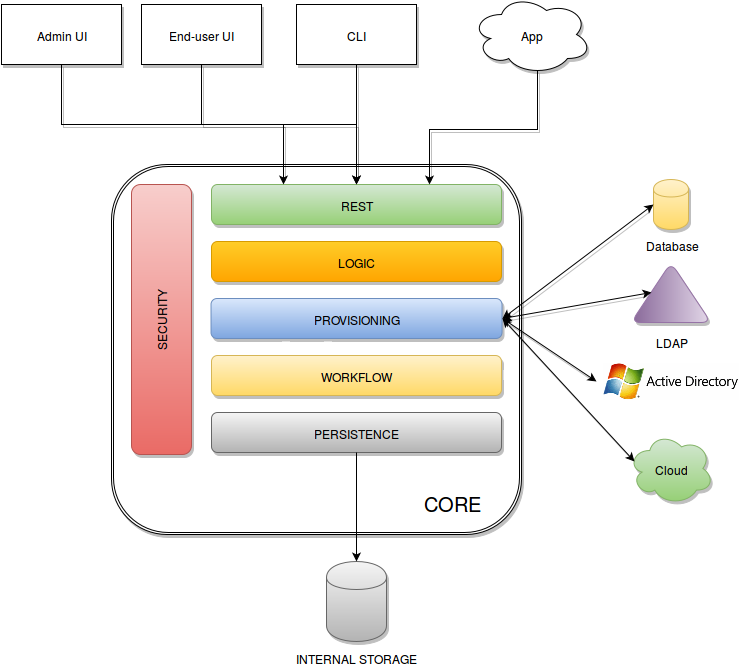 The Provisioning layer relies on ConnId; ConnId is designed to separate the implementation of an application from the dependencies of the system that the application is attempting to connect to. ConnId is the continuation of The Identity Connectors Framework (Sun ICF), a project that used to be part of market leader Sun IdM and has since been released by Sun Microsystems as an Open Source project. This makes the connectors layer particularly reliable because most connectors have already been implemented in the framework and widely tested. The new ConnId project, featuring contributors from several companies, provides all that is required nowadays for a modern Open Source project, including an Apache Maven driven build, artifacts and mailing lists. Additional connectors – such as for SOAP, CSV, PowerShell and Active Directory – are also provided. The hardware requirements depend greatly on the given deployment, in particular the total number of managed entities (Users, Groups and Any Objects), their attributes and resources. 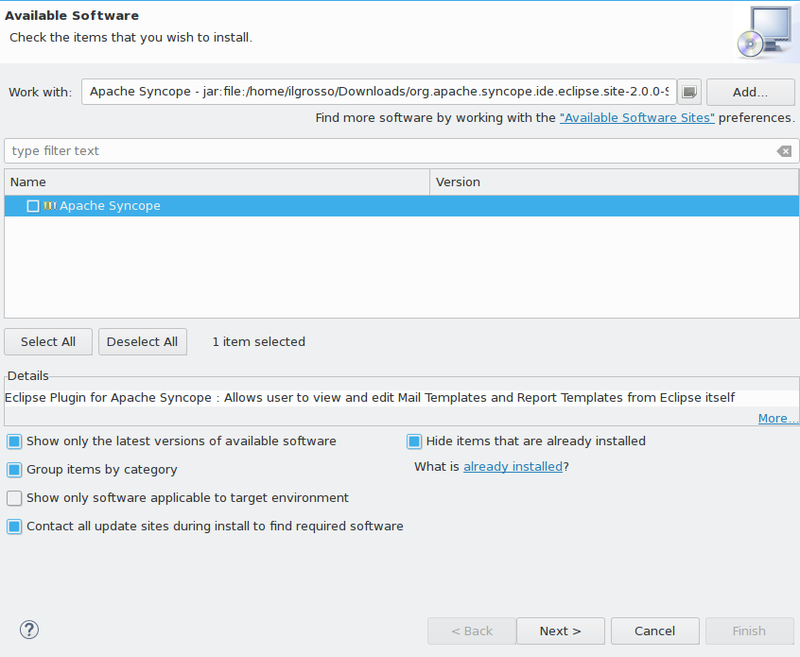 Apache Syncope 2.1.4 requires the latest JDK 8 that is available. There are several ways to obtain Apache Syncope: each of which has advantages or caveats for different types of users. 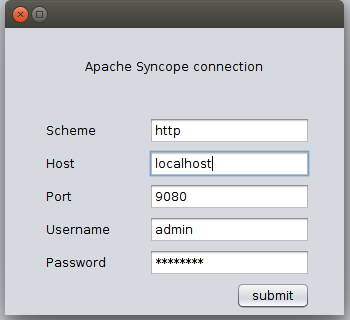 The standalone distribution is the simplest way to start exploring Apache Syncope: it contains a fully working, in-memory Tomcat-based environment that can be easily grabbed and put at work on any modern laptop, workstation or server. First approach, especially with administration console and end-user; does not require technical skills. Not meant for any production environment. 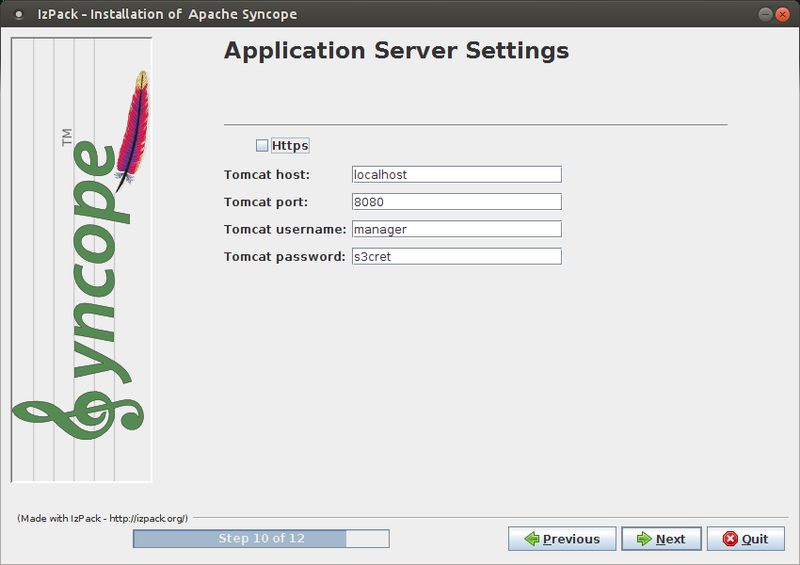 Please refer to the Apache Tomcat documentation for more advanced setup and instructions. The set of provided components, including access URLs and credentials, is the same as reported for embedded mode, with the exception of log files, available here under $CATALINA_HOME/logs. By default, the standalone distribution is configured to use an in-memory database instance. This means that every time Tomcat is shut down all changes that have been made are lost. in webapps/syncope/WEB-INF/classes/domains/Master.properties (for Master domain) or webapps/syncope/WEB-INF/classes/domains/Two.properties (for Two domain) from the Apache Tomcat directory. This will create H2 database files in the home directory of the user running Apache Syncope. Please refer to the H2 documentation for more options. Debian packages are available for use with Debian GNU / Linux, Ubuntu and their derivatives. Getting up and running quickly on Debian / Ubuntu. Difficult to extend beyond pre-sets. The following assumes that protocol, host and port reflect your Apache Tomcat installation. 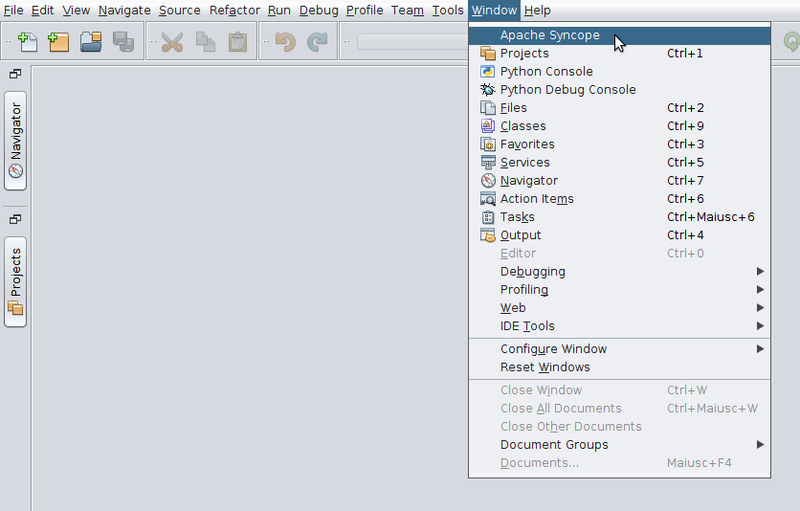 GUI application for configuring and deploying Apache Syncope on supported DBMSes and Java EE containers. Getting up and running quickly on any supported DBMS and Java EE container, independently from the underlying operating system. Ensure that the syncopeMasterDataSource datasource is correctly configured before proceeding. The following assumes that protocol, host and port reflect your Java EE container installation. Docker images ready to use, published to Docker Hub. Getting up and running quickly on Docker. All configurations available to set, difficult customizations. Working with these images requires to have Docker correctly installed and configured. The Docker images can be used with orchestration tools as Docker Compose or Kubernetes. 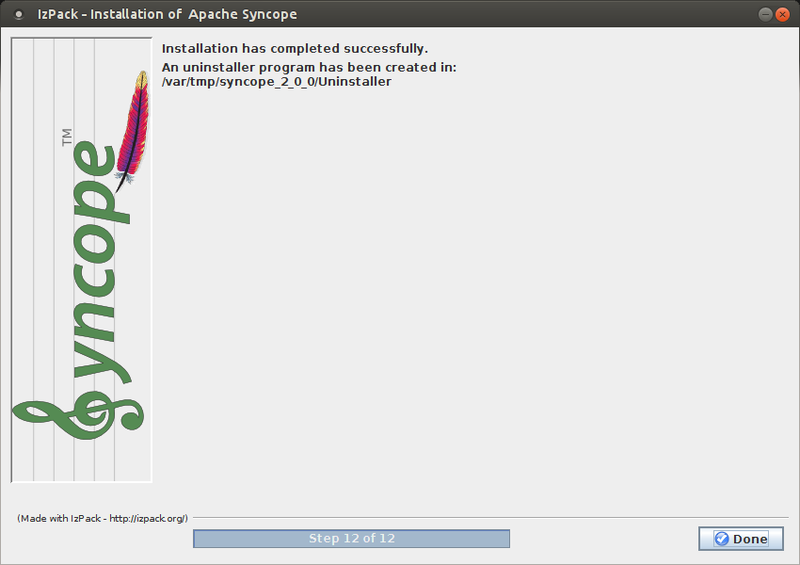 Apache Syncope Core, see above for information. 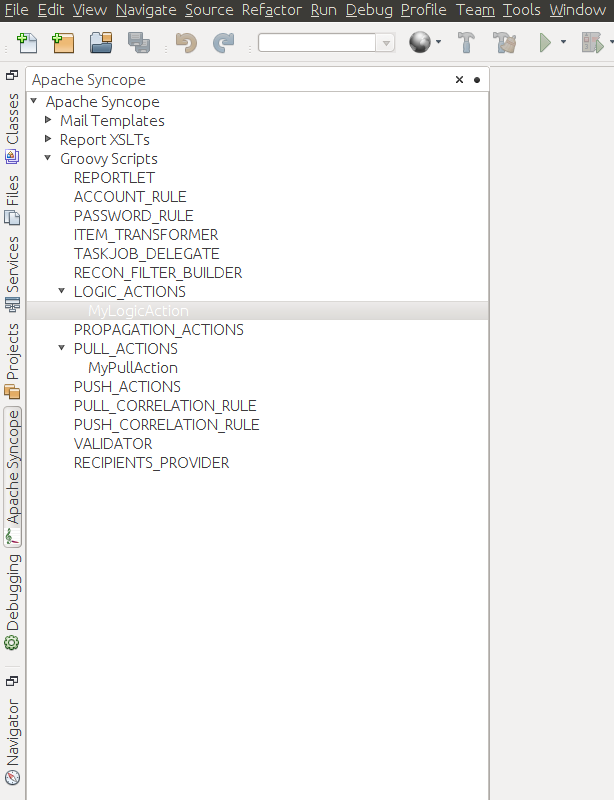 Apache Syncope Admin UI, see above for information. 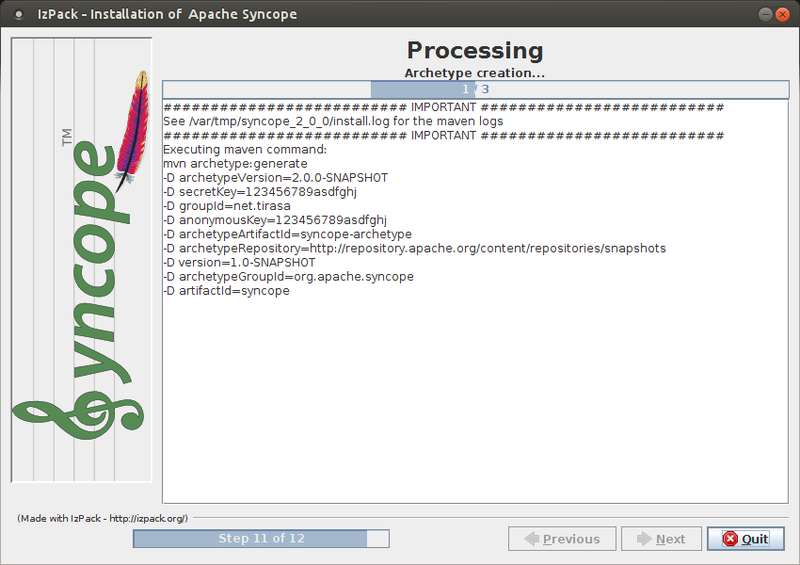 Apache Syncope Enduser UI, see above for information. Besides the one reported below, more samples are available. The docker-compose.yml below will create and connect 4 Docker containers to provide a full-fledged, single instance, Apache Syncope deployment. All referenced images are available on Docker Hub. 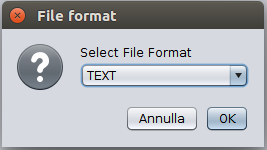 Save the example file locally. A set of example Helm charts is available, that can be used to install Apache Syncope directly in Kubernetes. 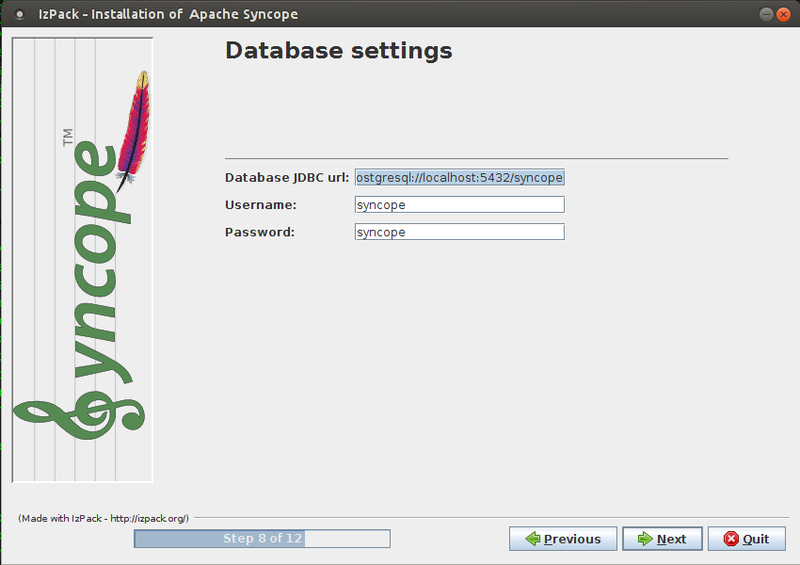 This is the preferred method for working with Apache Syncope, giving access to the whole set of customization and extension capabilities. 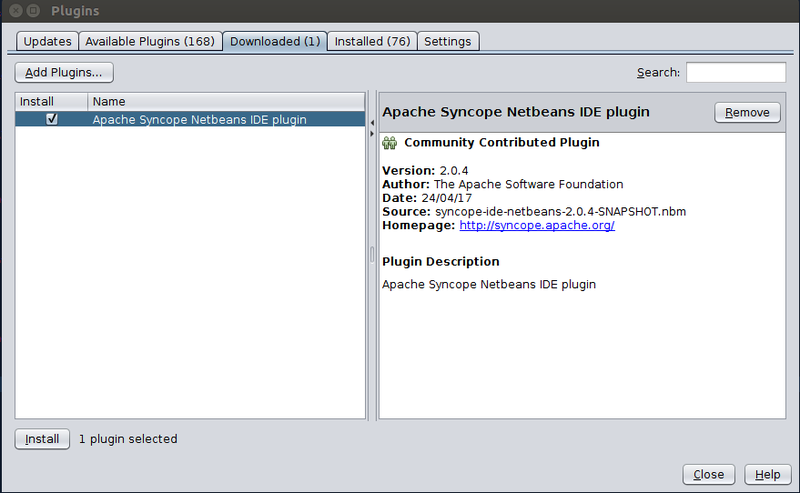 Provides access to the full capabilities of Apache Syncope, and almost all extensions that are possible. Requires Apache Maven (and potentially DevOps) skills. Some basic knowledge about Maven archetypes. Maven archetypes are templates of projects. 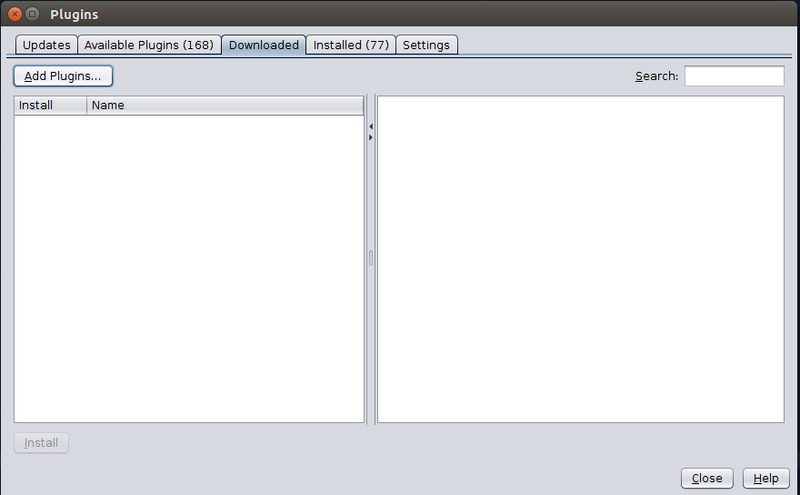 Maven can generate a new project from such a template. 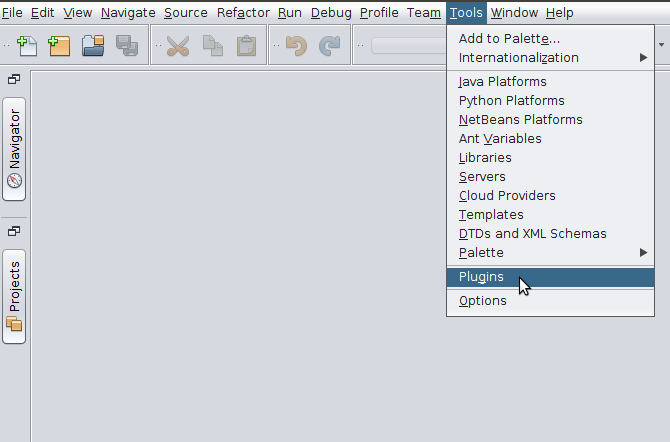 In the folder in which the new project folder should be created, type the command shown below. 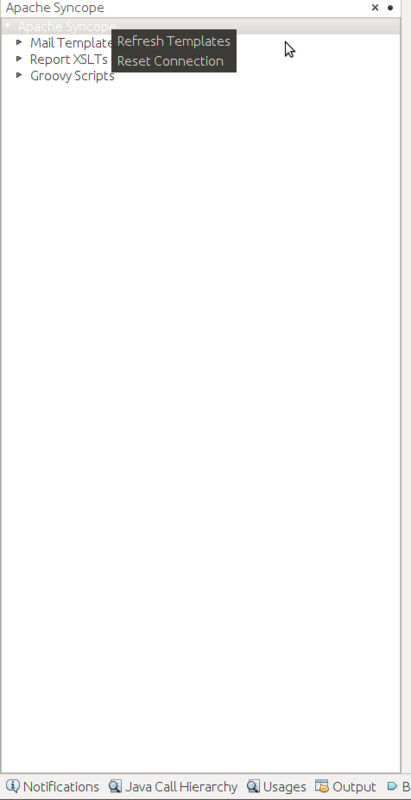 On Windows, run the command on a single line and leave out the line continuation characters ('\'). The archetype is configured with default values for all required properties; if you want to customize any of these property values, type 'n' when prompted for confirmation. 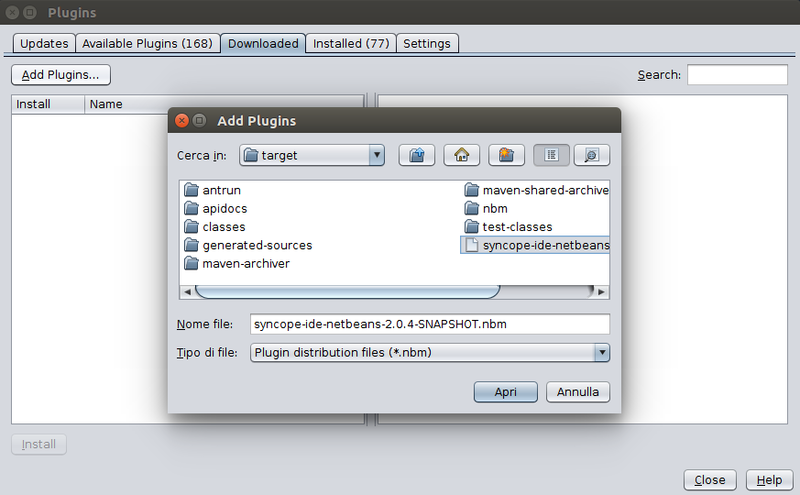 You can use the default; it is good practice to have 'SNAPSHOT' in the version number during development and the maven release plugin makes use of that string. But ensure to comply with the desired numbering scheme for your project. The java package name. A folder structure according to this name will be generated automatically; by default, equal to the groupId. Provide any pseudo-random string here that will be used in the generated project for AES ciphering. Provide any pseudo-random string here that will be used as an authentication key for anonymous requests. Maven will create a project for you (in a newly created directory named after the value of the artifactId property specified above) containing four modules: common, core, console and enduser. 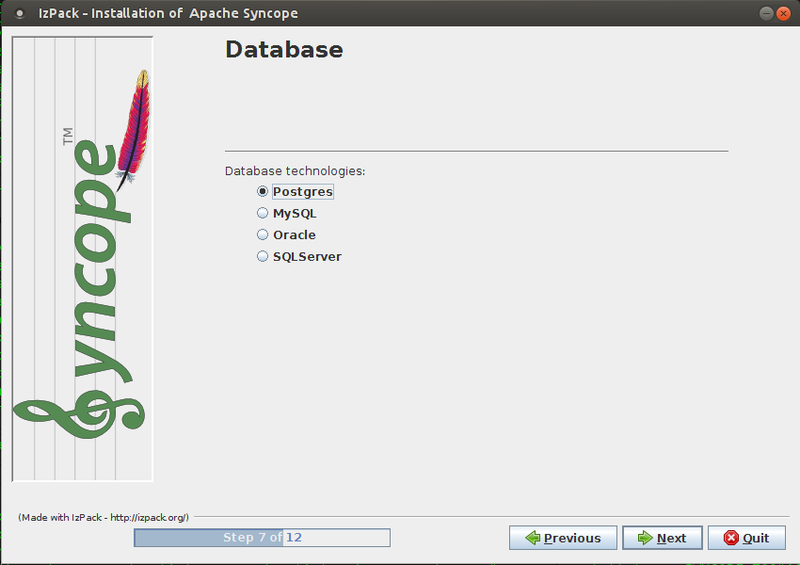 If no failures are encountered, your basic Apache Syncope project is now ready to go. 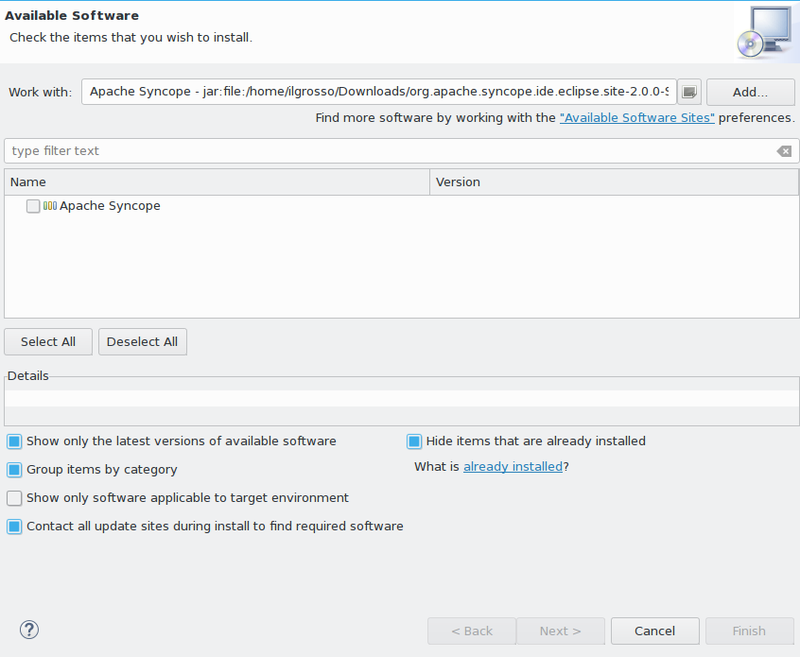 Before actual deployment onto a standalone Java EE container, you need to further check the Customization chapter of the Apache Syncope Reference Guide. Every Apache Syncope project has the ability to run a full-blown in-memory environment, particularly useful either when evaluating the product and during the development phase of an IdM solution. Don’t forget that this environment is completely in-memory: this means that every time Maven is stopped, all changes made are lost. The switch -P all is used here in order to build with all extensions available, with paths and settings configured for the embedded mode. 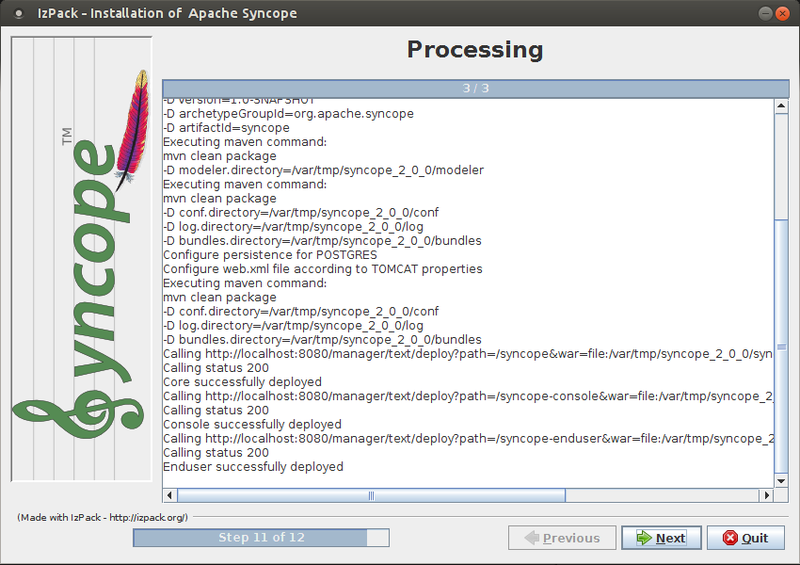 When building for production, instead, it is recommended to check the Customization chapter of the Apache Syncope Reference Guide. An Apache DS instance is available. H2 TCP database is available. The command-line interface (CLI) client is an utility tool meant for interacting with Apache Syncope deployments from shell scripts. Once downloaded and uncompressed, you will find a lib directory and two scripts: syncopeadm.sh and syncopeadm.bat, which will be used depending on the operating system. the password for the admin user configured above. As shown above, the password value is encrypted for security reasons. - Error: It seems you need to first setup the CLI client. Run install --setup. As the message suggests you have to start the installation again when this error occurs. 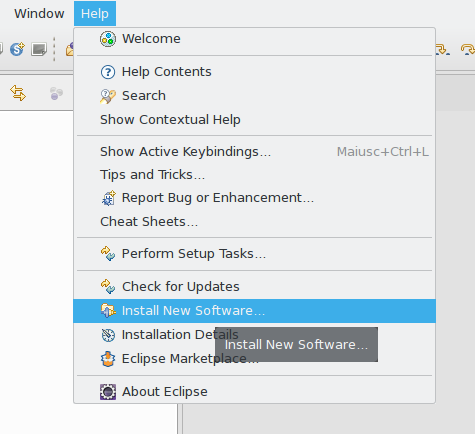 The Eclipse IDE plugin allows remote management of notification e-mail and report templates. Each template is now ready for authoring or removal; new templates can also be created. 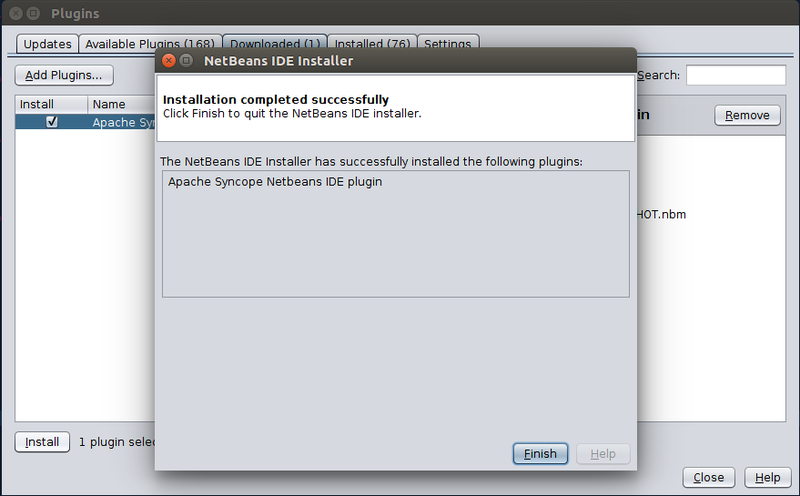 The Netbeans IDE plugin allows remote management of notification e-mail and report templates, and remote editing of Apache Groovy implementations. 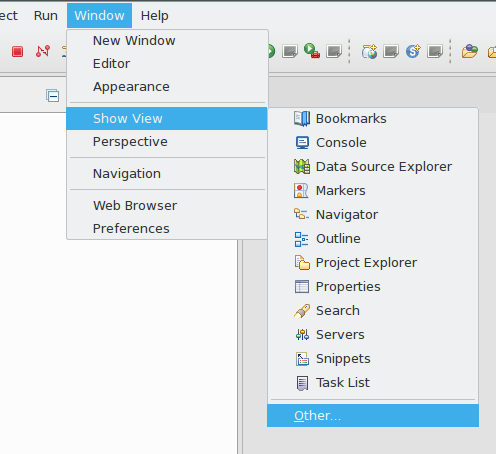 To edit am item, double-click on the item name and an editor will appear. 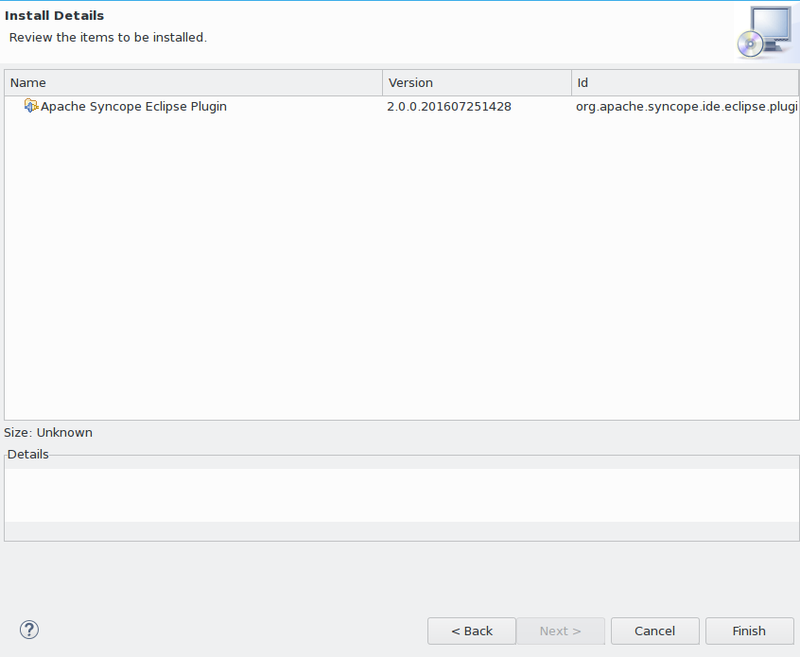 On save, the item content will be uploaded to the configured Apache Syncope deployment. 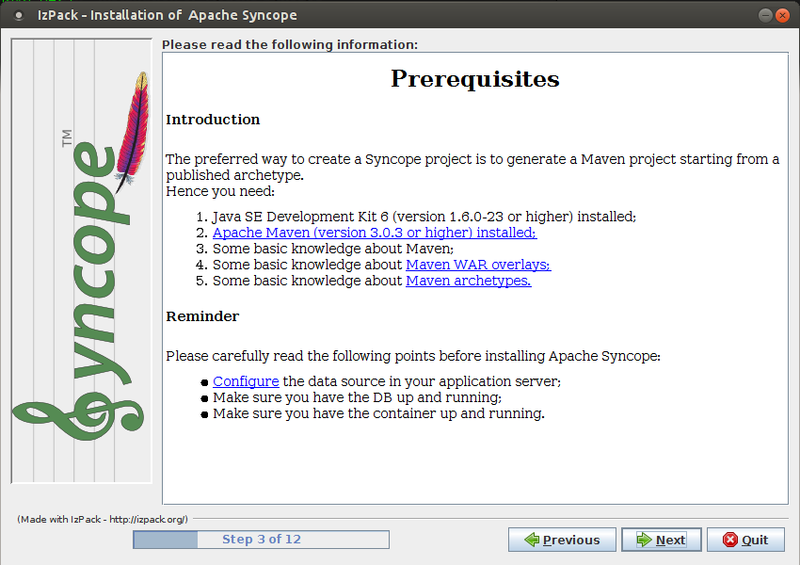 Once you have obtained a working installation of Apache Syncope using one of the methods reported above, you should consider reading the Apache Syncope Reference Guide. 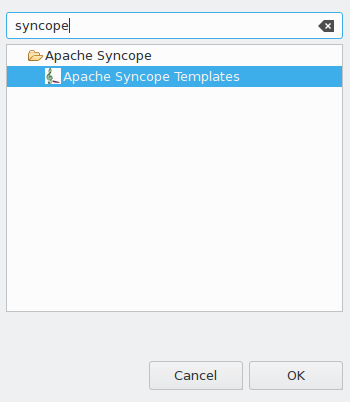 to understand how to configure, extend, customize and deploy your new Apache Syncope project. Before deploying your Apache Syncope installation into production, it is essential to ensure that the default values for various security properties have been changed to values specific to your deployment. adminPassword - The SHA1 hash evaluation of the cleartext password, the default value of which is "password". the configuration parameter "password.cipher.algorithm" is changed to "AES" (See section 4.6.14 "Configuration Parameters" of the Reference Guide for more information). anonymousKey - The key value to use for anonymous requests. jwsKey - The symmetric signing key used to sign access tokens. See section 4.4.1 "REST Authentication and Authorization" of the Reference Guide for more information. 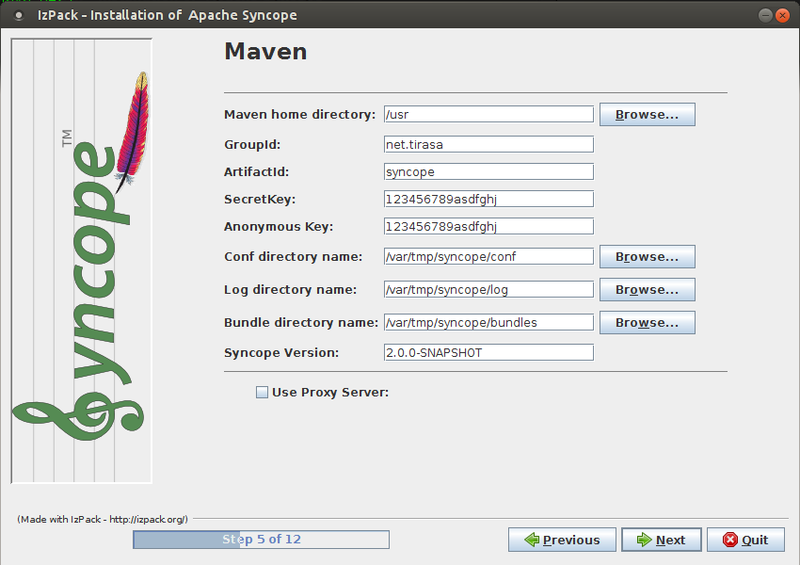 Note that if you installed Syncope using either the installer or the maven archetype methods, then you will have already supplied custom values for "secretKey" and "anonymousKey". Both installation methods will also query for "jwsKey", and the installer method will prompt for the "adminPassword" as well.